Glo Twin Bash promises extra bonus on a Data and Voice Bundle Offer that offers You 7 times the value of recharged amount. With this Glo Twin Bash amazing bundle offer, a data recharge of N100 gives you a lot of voice and data benefits including free data, free call bonus for friends and family. All you need is to buy a Glo recharge card of any value, dial the USSD code *223*PIN# and you get data plan worth the value of recharge, bonus data to gift and additional FREE Talktime. 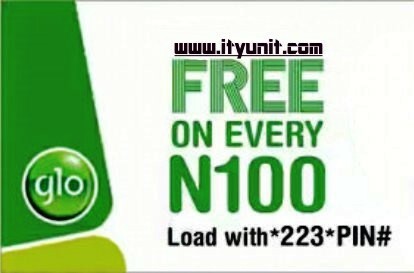 • Another FREE N100 to call Friends and Family. 2. Then, Choose the option 2 which is Twin Bash. Select the plan that suits you and follow the prompts to subscribe to it. Remember that the Data Plans cannot be accumulated and are not auto renewable. NOTE: To enjoy the plan to the fullest you must have at least N 100 on your account to subscribe to this plan. thanks boss for the info. but if i load 2k, does it mean i will get N2,000 worth of airtime to call all networks and N2,000 to call friends and family and 2gig capped for 30days? how many mb is reserved to be gifted.